Walking Street Chinatown Bangkok is the section of Chinatown south-west of the main street Yaowarat Road, between Yaowarat and the Chao Phraya River, an area steeped in the history of Bangkok. It offers a different aspect of Chinatown Bangkok which is usually a walk down congested Yaowarat Road, with its goldsmith shops, restaurants, Chinese medicine shops, streets clogged with traffic and pavements jammed with street vendors and shoppers. Unlike Yaowarat Road, Walking Street is a route designed to link areas of historical interest and local communities in a journey of contrasts through the heart of Chinatown. Stretches of the way are paved with red tiles and red lamp posts in Chinese design serve as route markers. If Yaowarat Road is likened to a dragon weaving through Chinatown, Walking Street in Chinatown Bangkok is the dragon's under belly. It's a side that visitors rarely see. Our historical journey down Walking Street Chinatown begins at the River City Center for antiques and art near the N3 Si Phraya Pier on the Chao Phraya. We make our first stop at the Holy Rosary Church built by the Portuguese in 1786. The present church is a third rebuilding completed in 1898. Next to this old Portuguese church, Italian architect Annibale Rigotti left his mark. 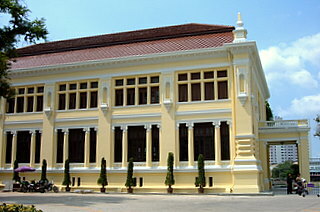 This is the Talad Noi branch, the first branch of the Siam Commercial Bank the oldest Thai bank in the country, established in 1906. Take the left folk to Soi Wanit 2 and continue down a quiet, narrow lane lined with two-storey houses. The scene along this soi changes abruptly as we enter a stretch with shops dealing with scrap cars, old auto spare parts and scrap metal. There's another change in scenery in Walking Street Chinatown Bangkok as we get onto Song Wat Road. We approach Wat Pathum Khong Kha, a temple built during the Ayutthaya era and restored in the reign of King Rama I (1782-1809) when Bangkok was established as the new capital. 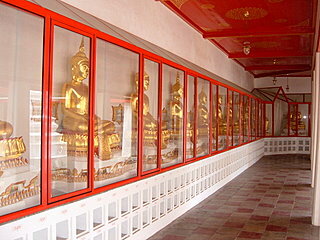 The cloisters on the inner walls around the temple are lined with golden Buddhas. 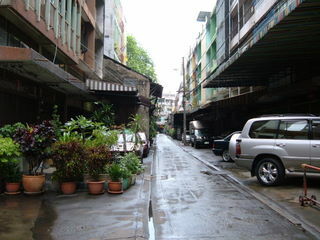 Continue on to Trok Khao San or Khao San Alley. A quiet lane, with children playing, women chatting with their neighbors and men having an afternoon nap or an early drink, common scenes the world over. 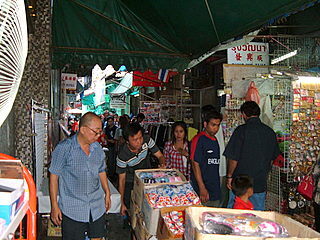 Trok Khao San leads on to Soi Wanit 1 which has a bustling street market, the famous Sampheng market. When the Grand Palace was built, the Chinese who were originally living near the palace site were relocated to this lane from which Chinatown grew. 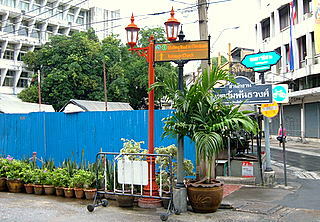 Soi Sampheng which has been renamed Soi Wanit 1, is the birthplace of Chinatown Bangkok. Inch shoulder to shoulder with the crowd through this narrow alley packed with stalls and flavor the local bazaar. This market will continue pass the junction with Ratchawong Road right on to Chakrawat Road. Cross Chakrawat Road and you'll find yet another congested market in an area as old as Chinatown itself. Located near the Rob Krung canal, the second canal ring around the old Bangkok city, this area used to be the disembarkation point for Chinese immigrants coming to Bangkok. Some settled here and started the Saphan Han community where there’s another popular street market for the locals. The total distance of Walking Street Chinatown Bangkok is a little over two km. However it isn't easy going all the way, particularly within the narrow street markets. Progress is slow along these crowded alleys and it'll take a very determined shopper to go the whole way. But it's a real taste of the local community life. We end our journey through Walking Street Chinatown Bangkok at Saphan Han. The next stop further down the road is Pahurat Little India and the textile market. But that's another journey. 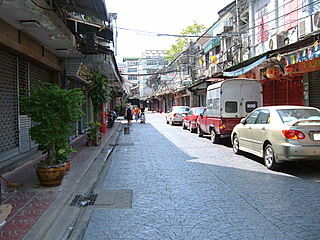 Most of this route has relatively lighter traffic and provides a more pleasant walk, a far cry from the conditions along Yaowarat Road.Walking Street Chinatown Bangkok provides a different perspective of Yaowarat for visitors who want to see other side of life in this bustling Chinese community. The best way to get there is to take the skytrain to the Taksin Bridge station. The Sathorn Pier is just below the bridge. From there take a Chao Phraya River boat to the Si Phraya Pier. From Wat Pathum Khong Kha proceed along Song Wat Road and Soi Wanit 1 then on to Sampheng market. Soi Wanit 1 and the Sampheng market will continue on to Chakkrawat Road. 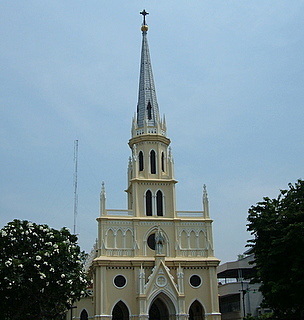 Cross Chakkrawat Road and you'll enter Saphan Han. 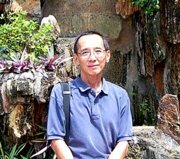 For another interesting historical route through the maze of alleys in old Chinatown, please see Chinatown Bangkok sights which has some quaint Chinatown landmarks and old shopping alleys. For another old shopping alley with historical significance, please see Soi Sun Yat Sen.